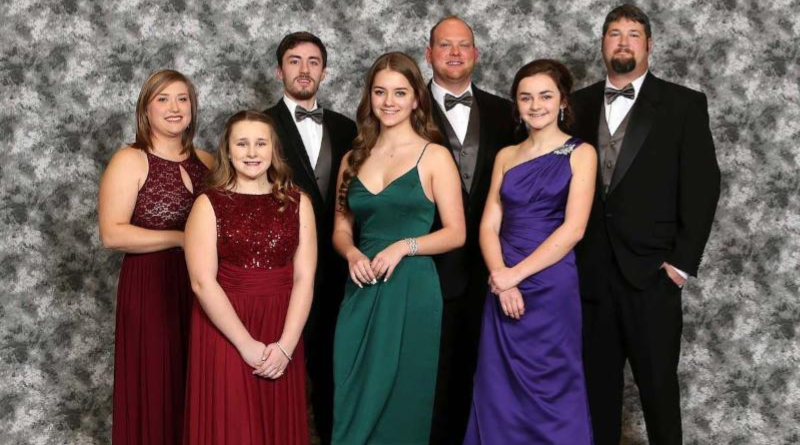 The amazing accomplishments of the 2018 Summit Motorsports Park champions earned an abundance of accolades during the energetic 45th Annual Edelbrock Banquet of Champions presented by Lincoln Electric, January 19, 2019 at Kalahari Resorts and Conventions in Sandusky, Ohio. The ceremony opened with side-by-side entrances by Bear Motorsports Junior Dragster presented by Wiseco Novice champion Alena Schafer and her father, Mark Schafer, Intermediate champion Morgan Curtis and her father, Bill Curtis, Advanced champion Mackenzie Kerns and her father, Ron Kerns, Wiseco/Cycle Tech Super Bike champion Michael Maday and his stepfather Tony Dolamore, Edelbrock Sportsman Delivered on Time by TFC Transportation champion Alyssa Galanek and her father Joe Galanek, Edelbrock Pro champion AJ Buchanan and his wife, Amy Buchanan, Edelbrock Super Pro champion Steven Schmidt and his wife, Kristen Schmidt, and 2017 Bill Bader Sportsman of the Year, Rick Guenther and his wife, Gina Guenther. Chris Harben sang “The Star-Spangled Banner” and a high-energy video highlighting action at Summit Motorsports Park and produced by Chris Ashworth played before Bader, Jr., his son and Summit Motorsports Park marketing specialistEvan Bader, and sister and Summit Motorsports Park sponsor sales and services specialist Bobbie Bader, began hosting the event, with Mark Storjohann from Edelbrock as their co-host. Acknowledged were special guests and banquet sponsors including Edelbrock, Lincoln Electric, Summit Racing Equipment, B’laster, Mickey Thompson Performance Tires and Wheels, Dornan’s Sales and Service, Racing RVs, Norwalk Lions Club, Classic Trophy, Ink, Inc. and Hagerty Insurance. Then, the spotlight turned to drivers who finished sixth through tenth in points, including Edelbrock Sportsman Delivered on Time by TFC Transportation drivers Jeremy Murray, Roy Dean, Jim Marcinowski, Bob Spishak and Parker Sherry; Edelbrock Pro drivers Chad Moss, Wes Buckley, Brian Klippel, Phil Hurst and Jaeden Durst and Edelbrock Super Pro drivers Rollie Anderson, Bob Cireddu, Kara Jo Brank, Aaron McCaulla and Steve Seredich. They were followed by drivers and riders who finished fifth in points, including Bear Motorsports Junior Dragster presented by Wiseco Novice driver Parker Novak, Intermediate driver Logan Buckley and Advanced driver Seth Jimenez, Edelbrock Sportsman Delivered on Time by TFC Transportation driver Derek Simon, Wiseco/Cycle Tech Super Bike rider Ed James, Edelbrock Pro driver CJ Yaeger and Edelbrock Super Pro driver Lisa Boes. Fourth place awards went to Bear Motorsports Junior Dragster presented by Wiseco Novice driver Roman Iocoangeli, Intermediate driver Zachary Doell and Advanced driver Ava Lawson, Edelbrock Super Pro driver Dave Burghart, Edelbrock Pro driver Damien Hazelton, Wiseco/Cycle Tech Super Bike rider Jeremy Hicks and Edelbrock Sportsman Delivered on Time by TFC Transportation driver Lance Oberg. Third place honors were delivered to Bear Motorsports Junior Dragster presented by Wiseco Novice driver Vincent Tiburzi, Intermediate driver Brandon Buchanan and Advanced driver Michael Crowell, Edelbrock Super Pro driver Carl Keil II, Edelbrock Pro driver Vic Ellinger, Wiseco/Cycle Tech Super Bike rider David Liguori and Edelbrock Sportsman Delivered on Time by TFC Transportation driver Chas Lang. Second place saw Bear Motorsports Junior Dragster presented by Wiseco Novice driver Nicholas Peters, Intermediate driver Ava Tiburzi and Advanced driver Kyle Beno, Edebrock Super Pro driver Fred Krakora, Edelbrock Pro driver Caleb Ellison, Wiseco/Cycle Tech Super Bike rider Gary Godwin and Edelbrock Sportsman Delivered on Time by TFC Transportation driver James Ring. Applauded for representing Summit Motorsports Park at the NHRA Junior Drag Racing League Eastern Conference Finals at Bristol Dragway in Tennessee were Ava Lawson, Kaitlyn Curtis, Kyle Alderman, Aubrey Collins, Logan Buckley, Braden Peters, Zachary Smith, Roman Iocoangeli, Chyanne Fry, Seth Jimenez, Kyle Beno, Adam Retford, Noah Rambow, Ava Tiburzi, Cruz Schafer, Brinasia Pollard, Vincent Tiburzi, Callie Martel, Antonio Iocoangeli, Allyson Downs, Mackenzie Kerns, Kaitlyn Zietlow, Lizzie Martel, Kevin Waite, Morgan Curtis, Ashley Etzel, Grant Welte, Alena Schafer, Nicholas Peters, Riley Cole, Bryce Buehrer, Peyten Jimenez, Courtney Grisez, Amanda Shaw, Madison Shaw, Hannah Shaw and Allie Harrison. Summit Motorsports Park drivers who qualified for the North Central Division NHRA Summit Racing Series Team Finals at Lucas Oil Raceway in Indianapolis also were feted. Representing Edelbrock Super Pro were Steven Schmidt, Lisa Boes, Adam Albright, Kara Jo Brank, Aaron McCaulla, Ryan Pickens, Rollie Anderson, Corey Nolen, Tim Schmidt, Dan Sajewski and Kristen Schmidt. The Edelbrock Pro team consisted of Wes Buckley, Chad Moss, Damien Hazelton, Brian Klippel, Marcus King, Cameron Groff, Kim Moritz, Nathan Schultze, Randy Murphy, Alex Miller and Jason Kruse, while the Edelbrock Sportsman Delivered on Time by TFC Transportation team included Chas Lang, Alyssa Galanek, James Ring, Lance Oberg, Derek Simon, Parker Sherry, Sam Anderson, Roy Dean, Larry Strohscher and Robert Callipare. Wiseco/Cycle Tech Super Bike featured Michael Maday, David Liguori, Jeremy Hicks, Ed James, Don Stokes and Jesse Baker. At that event, Larry Strohscher won Best Appearing Sportsman, Evan Bader won the Track Operators Race and Jeremy hauled to a win in the Super Bike category and went on to the NHRA Summit Racing Series National Championship in California, where he finished as runner-up. Best Appearing awards went to Edelbrock Super Pro driver Steven Schmidt, Edelbrock Pro driver Dave Klippel, Edelbrock Sportsman Delivered on Time by TFC Transportation driver Jennifer Cooper, Wiseco/Cycle Tech Super Bike rider Jesse Baker, Bear Motorsports Junior Dragster presented by Wiseco Novice driver Nicholas Peters, Intermediate driver Morgan Curtis and Advanced driver Callie Martel. Among the highlights of the night was Bader Jr. reading the name of each Bill Bader Sr. Sportsman of the Year back to 1975 before asking those in attendance to join him on stage. There, they all warmly welcomed Edelbrock Super Pro driver Tim Schmidt as the 2018 Bill Bader Sr. Sportsman of the Year, and as an added element, the obviously touched Schmidt accepted his trophy from last year’s Bill Bader Sr. Sportsman of the Year, Edelbrock Pro driver Rick Guenther. “I’m thrilled to see the honor of a Sportsman of the Year bestowed upon Tim Schmidt,” said Bader Jr. “He’s a high-caliber human being and very deserving of being installed into our Hall of Fame.” Additional awards were given to Edelbrock Sportsman Delivered on Time by TFC Transportation driver Alyssa Galanek for Most Improved, Edelbrock Super Pro driver Adam Albright for Rookie of the Year, Dr. Nancy Berk of Parade for Media of the Year, Kurt Johnson of Total Venue Concepts and Paul Bursley of Krystowski Tractor Sales for Appreciation, Mickey Thompson Performance Tires & Wheels for Manufacturer of the Year and Lingenfelter Performance Engineering for Sponsor of the Year. Melanie Salemi was recognized for earning the 2018 championship in R&R Auto Body/DeCerbo Construction Rumble Wars Extreme 8, which is an exciting new series contested at select events at Summit Motorsports Park, and Summit Motorsports Park racers who went on to do well on a national level also were recognized, including Seth Jimenez, the 2018 Midwest Junior Super Series E3 Spark Plugs Pro Sportsman champion, Tom Martino, the 2018 PDRA Top Dragster champion and Phillip Smida II, the 2018 JEGS All Star champion. Additional attention was directed to the Edelbrock Super Series, which awarded the top performers with over $54,000 in cash, and the Lucas Oil Super 64 presented by McIlvain Race Cars, which awarded qualifiers the chance to win a total purse of $41,300 with $25,000 going to the winner. Also acknowledged were unique programs including the R&R Auto Body Paint-My-Ride Program, which awarded Edelbrock Super Pro driver Adam Albright a custom car makeover; the Delivered on Time by TFC Transportation Bonus, which awarded a minimum of $500 to racers laying down perfect passes in Edelbrock Pro, Edelbrock Super Pro, Wiseco Cycle Tech Super Bike and Edelbrock Sportsman delivered on time by TFC Transportation, plus $100 to the runner-up, and a scholarship for a driver to attend the Frank Hawley Drag Racing School. Additionally, Bear Motorsports Junior Dragster presented by Wiseco offered a thrilling opportunity for drivers to compete in the 2018 season-long points chase for $3,000 in cash and awards, and the Summit Racing Equipment Jr. Dragster Shootout allowed the top eight junior-dragster drivers in Novice, Intermediate and Advanced to race in front of fans for a share of $7,000 in cash and prizes. Those programs, paired with an expansive contingency program, bonuses and incentives, awarded Summit Motorsports Park racers with nearly half a million dollars in cash and prizes. Summit Motorsports Park offers a hearty and heartfelt congratulations to each champion and award recipient. Please visit the park’s website in the upcoming days for stories on champions and some award recipients. Summit Motorsport Park is at 1300 State Route 18, Norwalk, Ohio. For more information, please call 419-668-5555 or visit www.summitmotorsportspark.com. As a major motorsports venue, Summit Motorsports Park welcomes more than 500,000 people each year for sportsman and professional drag racing and is home to the Summit Racing Equipment NHRA Nationals. Located on more than 225 acres and surrounded by theme parks and water parks, it has been named Track of the Year 19 times by the NHRA, NMCA and IHRA, and its annual economic impact to the community has been determined to be more than $100 million.